We are specialists in Mobile phone spare parts, repairing tools and accessories. Established in Co. Laois, today we provide reliable and affordable cell phone repair parts with a splash of great customer service to go with it. Our product range include iPhone Parts, Samsung Galaxy Parts, HTC Parts, Sony Xperia Parts, BlackBerry Parts and Nokia Parts. Parts inlcude bateries, LCD screens, connectors, cables etc. This is teh best place to buy mobile phone parts in Ireland. 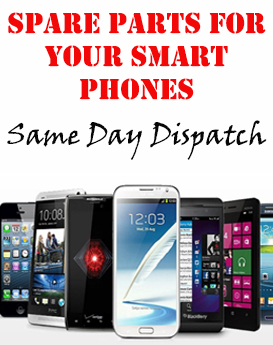 You can buy online, we provide same day dispatch for all our orders. If you cant find the mobile phone part you are looking for, please contact us, we will try to source that for you. Look out for our great value offers and promotions on mobile phone parts that give you a little bit extra. We offer fast reliable delivery and our site is totally secure so you can shop with confidence.